It’s pretty obvious a lot of homeowners are going with one piece gutter and cover systems around here. You’ve seen these, the gutter is rolled out with a top on it that slides up under the first course of shingles. The metal cover lets debris blow over the edge of the roof, but the water clings, rolls over, and falls into the gutter. Cool. This seems to be a good tool here in the icy, leafy, rainy mid-west. Like insulated window glass and tankless water heaters, what starts out a little more expensive and daring will probably prove to be standard equipment soon. A lot of homeowners are really just waiting for a reason to spend the money to replace their existing gutters and downspouts. When they do, most are going with the self cleaning type. Then there’s the rest of us. Our gutters just won’t die. A lot of gutters get replaced with a new roof. Maybe a tree or limb falls on the house. Some gutters are pulled down by snow and ice loads. Not these gutters. These are the gutters that don’t justify being replaced, and demand attention a few times a year. Spring and fall seasons both create lots of blooms, seed pods, pine cones, nuts, needles, twigs and leaves. If the tree is close to, or over the house the gutters will be affected. Valleys on a roof are almost as challenging as gutters. They fill with debris too. 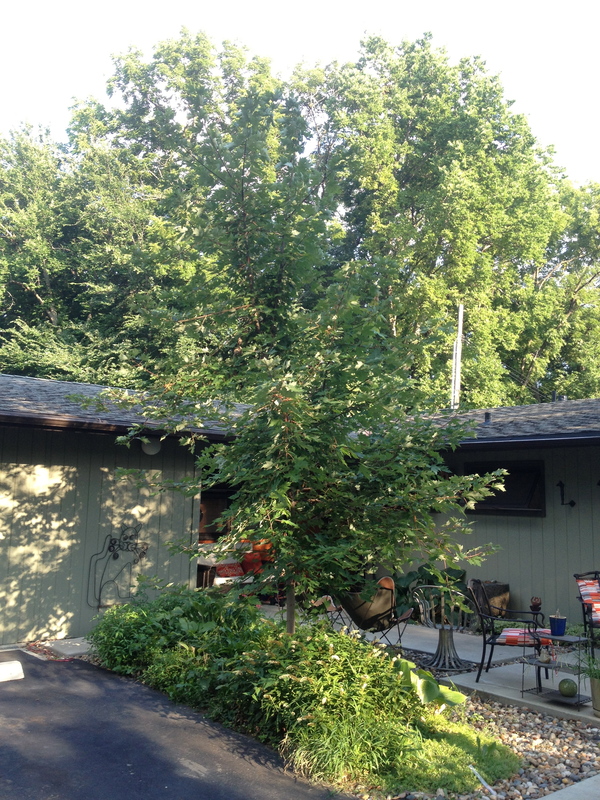 Gutters need to be cleaned out a couple times a year if trees are over the house. The time and frequency depend on the type of tree, it’s seasonal changes and the placement of the gutters, valleys and downspouts under the tree. Every house is different but spring and fall are the biggies. This is part of the getting to know your house process. Observe your gutters during a rain storm. If water’s flooding over the gutter midway between downspouts, it’s not emptying fast enough and is clogged. Don’t ignore this. Look out second floor windows to lower roof sections. Climb a ladder with a good brace and look for yourself. You’ll find your gutters have a pattern of filling and clogging and needing attention. Gutters are like the places out on the front porch where the wind carries leaves and deposits them in a regular pattern. Except up high. Cleaning gutters can be as easy as a phone call away. Hire a pro. Someone qualified to add a few screws and hangers. Someone who will straighten up the long runs of gutter that have been pulled hard by winter snow and ice. Hire someone with liability insurance. You can do this yourself too. Make sure you use a brace at the top of your ladder. Add some self adjusters to the bottom of the ladder if your property has slopes. Get a paint bucket hanger and a five gallon bucket. Scoops made just for gutters are available at most hardware stores and home centers. Gloves will protect your hands from sheet metal edges and screws. Keep the ladder off the gutter by using a brace at the top. The first time you clean your gutters you’ll climb the whole thing just getting to know the house. After a couple more runs you’ll learn the pattern of debris and know just where to climb the next time. All along, tighten loose hangers and add hangers where needed. Snow and ice can really be hard on gutters during the winter. Make sure the down spouts are clear and are extended about three feet out from the foundation. If you have ice dams and snow build up, install some de-icing wires. These are available from most good hardware stores. They have a formula printed on the box based on measurements taken from the house. De-icing wires are great. I wish more people used them. They prevent ice dams and weighted gutters in winter. A good electrician will install these too. Some one story house’s gutters can be blown clean with attachments for your lawn and leaf blowers. How easy is that?! Then there’s the season. Fall right now. Cleaning gutters is sort of nice. Climbing the house in somewhat cool weather. The leaves are thinning out and changing colors. The sun is in a different place in the sky than the last six months. Summer’s beaming heat is smelling like cool, crisp change. Autumn is good. Climbing a ladder in autumn, looking over the roof, seeing the sun move toward westerly skies. It’s relaxing. Standing at the top of the ladder looking down a run of gutter waiting to be cleaned and adjusted. It’s comfort work. Do this a couple times a year. Keep your gutters clean. Clogged gutters eat facia boards, flood foundation walls, sag and fall and are unsightly. Take good care of your gutters. When you’re tired of climbing a ladder yourself. Hire it if you like. When the first chance arrives to add self cleaning gutters, do it, it will be worth it. Leave the ladder in the shed. Forget the bucket and scoop. Get outside and see the autumn sun move across the sky. Winter is here soon.